YSU IB staff and students have the right to access the library. 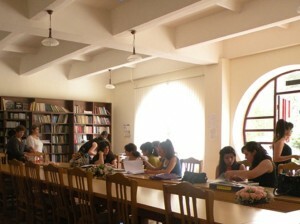 Other people can make use of library services through the permission of the library management. The reader orders the material (literature) in the subscription section. In case the reader does not demand the pre-ordered book within 3 days, the book is returned to the stack. The ordered book is given for a maximum of one month. Ancient, rare and one-example editions, dissertations, informative publications, periodicals, magazines are not allowed to be taken out of the library. If needed, copies may be ordered.